The scorching summer heat can become tolerable if we eat the right food items. Just like in winter we eat more soups and hearty meals to keep ourselves warm; light and fresh dishes keep us rejuvenated and hydrated in the summer. Such is this recipe. A few different types of fresh produce cooked together to bring elegance in taste and color to your meal. 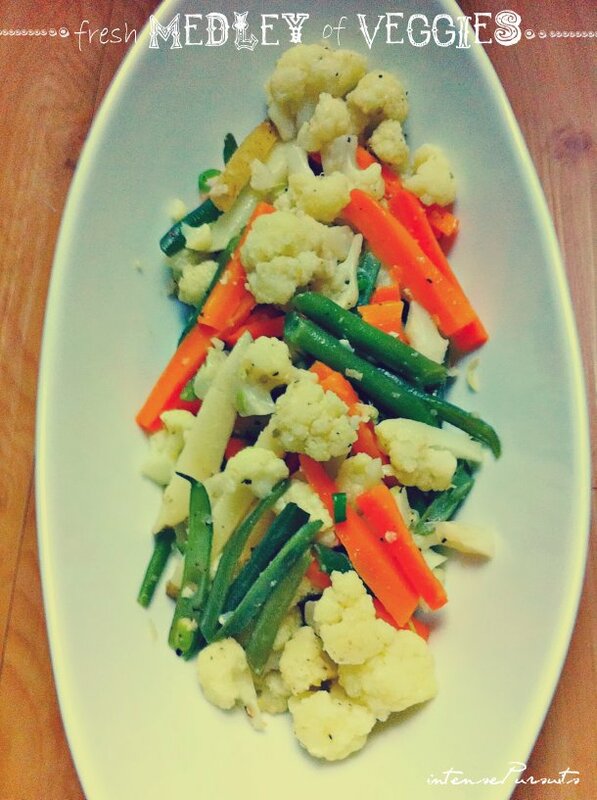 The right mix of vegetables also enhance taste considerably. So lets see how to make this lovely dish. First thing first - all the vegetables need to be cut up prior to cooking since they will cook at the same time releasing their sweet juices. Cut the cauliflower into small florets. Cut the carrots lengthwise like french fries. Cut the green beans the French way - this will make sure that they are cooked through. Cut the potatoes just like the carrots. Take a pan and heat the butter. Once the butter is melted, toss in the grated ginger. Stir until fragrant. Now toss in all the vegetables together. Lower the heat to medium low. Add the salt and stir to mix the butter with the vegetables. Cover and cook until everything is cooked through. The veggies will cook in their own juice. Their will be no added water. At the very end add the chopped up green chilis [for the heat] and the fresh cracked pepper. Taste and adjust seasoning. Bon appétit!